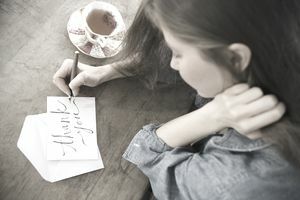 Sending a thank-you note after an interview, networking event, or any other event related to your job search, is a great way to show your professionalism. It is also a way to maintain contact with people you meet during your job search after you get hired. Thank-you notes aren't just for job searching. Sending a written note, email message, or LinkedIn message to people who have helped you on the job or have done something that will enhance your career is a good way to cement relationships as well as to show your appreciation. Send one. You should send a thank-you letter whenever someone helps you with your job search. You should send a thank-you for a job interview, an internship, an informational interview, and any other situation where you received career assistance. If someone did something nice or helpful at work, send them a thank-you email message or note. Consider the format. Some people send handwritten thank-you notes, and others send typed letters. Some formal organizations (like law and accounting firms) might prefer a traditional handwritten note. A handwritten note also allows you to give a personal touch to your message. However, most companies are fine with a typed letter. Think about the company culture when deciding the format of your letter. Send as soon as possible. You want to send your letter as soon as possible. This is especially important for an interview thank-you letter; you want to remind the interviewer that you are a strong candidate before he or she makes a decision. For this reason, you might choose to send a thank-you email instead of a note or typed letter. You can also send an email and then follow up with a note. Be concise. Keep the letter short – no longer than a page. You want to say thank you sincerely but briefly. Sell yourself. If this is a thank-you letter for an interview, use the letter as a chance to remind the employer why you are an ideal candidate. Remind them of something you discussed in the interview, or provide some new information that you forgot to mention. This is your last chance to make a strong impression. Proofread. Be sure to thoroughly edit your letter. It's important that all your communications look professional and polished. Thank-you letter samples are a useful way to guide your own writing. A sample can help you decide what kind of content you should include as well as how to format your letter. Thank-you letter templates can also be very useful. They help you with the layout of your letter, such as how to organize the different sections of your message. While letter samples and templates are great starting points for your own message, you should always edit a message to fit your situation. A personalized letter or email will make the best impression. There are guidelines you should follow for writing your letters, including standard length, margins, font, and format. Sending a properly formatted, grammatically correct letter or email message will leave the reader with the best impression. This is an interview thank-you letter sample. Download the letter template (compatible with Google Docs or Word Online) or read the example below. Thank you so much for interviewing me for the open sales position. I appreciate the time you spent explaining the hiring process and how your training program works. You’re clearly very knowledgeable about sales and marketing. I enjoy working in sales and believe I would be an excellent fit for the position. I love a challenge, and your innovative training program intrigues me. As we discussed during the interview, my sales numbers at my current job increased by 50 percent over the past three years, and I was at the top of our sales force last year. I’m confident that combining my current experience with your training program will allow me to reach the top of your sales force as well. Thank you again for taking the time to talk to me about the position. I believe I can benefit your company and look forward to meeting again soon. In the meantime, please let me know if you need any additional information. Contact Information: If you are sending a printed letter or note, list your contact information above the salutation. If you are sending an email thank-you message, list your contact information below your signature. ​First Paragraph: Your first sentence should state that you are reaching out to thank the recipient for what they have provided you. In this first paragraph, you might include another sentence reiterating your thanks: for example, you can acknowledge that you know they are a busy person, and you are especially grateful that they took the time to help you. While your tone should come across as expressive and warm, avoid going overboard with effusive praises and never-ending thank you's. Ultimately, you want to be sure your communication is genuine. Second Paragraph: In your second paragraph, you can explain why you are so grateful and how, specifically, their support has impacted you, or how you anticipate it impacting you in the future. It is important to be specific so that the reader knows this is a personal letter, rather than a generic one you've sent to multiple contacts. Third (optional) Paragraph: Use your optional third paragraph as a way to maintain your relationship with this person going forward. If you feel like you have something to offer them in return, you could mention it in this paragraph. Alternately, you could suggest that you'd love to treat them to a coffee or simply that you would like to stay in touch. Ultimately, you should tailor what you say based on your relationship with the person, but the goal of this paragraph is to keep the door open to future communication. ​Finally, in your closing paragraph, reiterate your gratitude with a simple, short final sentence. Thank-you letter to send after an interview. This letter reiterates your interest in the job and reminds the interviewer why you are qualified for the position. Use this note to thank the interviewer and to mention that you are available to provide more information on your candidacy. Thank-you letter template to send after a job interview. Edit this template to include your personal information. Email thank-you message to send directly after a job interview. If you're a college student or recent graduate just starting a career, use this example to write a thank-you letter for an entry-level job. Sample letters to say thank you for a job well done or thanks for the help at work, and letters to show your appreciation to a co-worker or manager. Here is a general thank-you letter you can send (via email or mail) to the people who have helped you with your job search. This sample thank-you letter requests a second interview and reiterates your interest in the position. Thank-you note to send after an internship interview. Sample thank-you letter accepting a job offer. Sample letter to thank a prospective co-worker who spent time meeting with you during the interview. Sample appreciation letter to send to a contact who assisted with your job search. Here is a sample letter you can send (via email or mail) to networking contacts who help you with your job search. Sample thank-you letter that thanks the employer for the job offer but politely declines the position.